Looking for a great weekend getaway that’s an easy drive and easy on the wallet? Check out the following packages that can be booked as shown, or you can customize a getaway to meet your unique needs. Feel free to contact us at info@golfclubmasters.com with questions about the hotels, golf courses, and amenities offered. Also, visit our “Indiana Courses” section for detailed golf course information, photos and website links. The Purdue Golf Experience … Premier Play & Stay! The Birck Boilermaker Golf Complex is a 36-hole championship golf facility designed by legendary course architect Pete Dye located in West Lafayette, Indiana on the campus of Purdue University. With two distinct courses, the rolling hills of the Ackerman-Allen Course and links style layout of the Kampen Course, the Birck Boilermaker Golf Complex is the crown jewel of the Pete Dye Golf Trail. With a wide array of “Stay and Play” packages, they have just the package for your group! Call the Pro Shop at (765) 494-3216 and ask for Daniel Ross, Head Golf Professional and Director of Instruction. He did a great job for our golf group of 40, and he will coordinate an amazing getaway for you! Packages can also be created for extended stays and for large groups as well. An easy drive from I-65, come and enjoy the Purdue Golf Experience! Visit StayandPlayHomeofPurdue.com/GNC to play your getaway. A Third Great Track To Complete Your Getaway! Do you need a third spectacular golf course to complete your “Stay and Play” group getaway? Well, less than 7 miles up the road from Purdue University is Coyote Crossing — it’s the perfect choice to round out your trip! 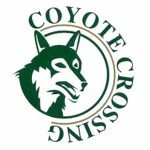 Coyote Crossing Golf Club is an award winning 18-hole, Hale Irwin designed championship golf course located in West Lafayette, Indiana just off I-65 only a few miles from Purdue University and just an hour north of Indianapolis and two hours south of Chicago. With its unique landscape and layout Coyote Crossing is an exceptional and unparalleled golfing experience that golfers of all skill levels can enjoy. Beautifully manicured fairways, challenging rough, strategically placed bunkers and water hazards test the accuracy and skill of even the best golfers. Contact Brent Wills, Director of Clubhouse Operations at (765) 497-1061, and he will take good care of your group. Coyote Crossing is a must play! Visit www.coyotecrossinggolf.com for more information. Located just 90 minutes from Chicago, Warren Golf Course at Notre Dame awaits with both challenge and beauty. This Coore & Crenshaw designed course will host the 2019 U.S. Senior Open and is open to the public. 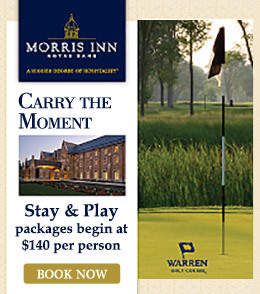 Morris Inn, at the heart of Notre Dame’s campus, offers an unbeatable Stay and Play Package. Rates begin at $140 per person for a traditional room and round of golf, based on double occupancy. For more information on Notre Dame “Stay and Play” packages, call (574) 631-2000 or visit morrisinn.nd.edu. Click the link below to book your package now. 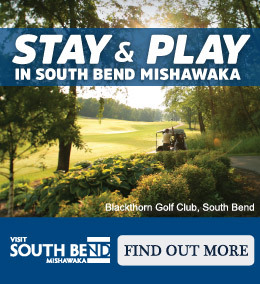 Stay and Play in South Bend Mishawaka! A fabulous golf getaway is a short drive around ‘the Bend’ in South Bend Mishawaka! A variety of hotel options are available through the Visit South Bend Mishawaka Convention and Visitors Bureau. Call 800-519-0577 or go to visitsouthbend.com. You don’t have to drive far to play championship golf, stay in exceptional hotels, and enjoy good times with family and friends. Come out and play top-rated Blackthorn Golf Club for the day, or make it a weekend getaway and enjoy all that Notre Dame and South Bend have to offer. Groups are welcome and customized packages are available. Let Blackthorn Golf Club plan your next golf getaway! New Ways to Play All Day! THE BLARNEY HOLE BY BLACKTHORN – HIT THE LINKS YEAR-ROUND! Formerly The Golf Club of Granger, The Blarney Hole by Blackthorn opened in late 2017 by the new owners – Tim Firestone and Erik Haag. Off to a great start in 2018, this newly rebranded bi-level indoor facility offers state-of-the-art golf simulators within a cozy pub-type relaxed environment. Play 18 holes of golf with your buddies and then switch the simulator screens to your favorite sports events, complete with leather chairs to relax, and a private event environment for your social or sports gathering. Book your next gathering, special event, or simply come out with friends for a round of golf, anytime of year. Enjoy great food and libations at the spacious bar, along with full-service catered events. Call (574) 232-4653 for more information or visit blackthorngolf.com. Four Winds continues to expand its premier brand with the opening of their fourth casino, Four Winds South Bend – just minutes from Blackthorn Golf Club in South Bend, Indiana. Major sponsor of the annual LPGA Symetra Tour/Four Winds Invitational hosted by Blackthorn Golf Club, Four Winds will now offer another premier “Escape The Everyday” experience for those wishing to extend their fun after golf at the new Four Winds South Bend! 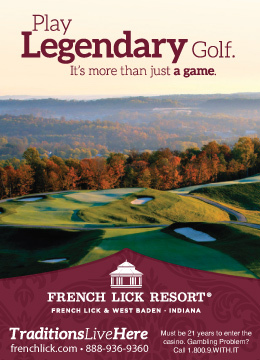 New Ways To Play and Stay At French Lick Resort! 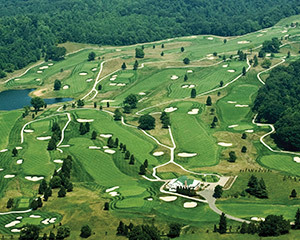 French Lick Resort, America’s top golf resort destination, includes two grand hotels, championship golf courses and more. Nowhere else can you play the courses of Pete Dye, Donald Ross, and Tom Bendelow at one resort. Experience the full gamut of golf – modern flair and traditional style – by playing two legendary courses designed by World Golf Hall of Fame architects Pete Dye and Donald Ross. Both courses have been rated in Golf Digest’s Top 100 of America’s Greatest Public Courses and are currently ranked by GolfWeek as the #1 and #2 Courses You Can Play in Indiana. Enjoy a one-night stay at either resort hotel, a day of golf on The Pete Dye Course at French Lick, a day of golf at The Donald Ross Course at French Lick, unlimited use of the driving range, cart rental, bag storage and complimentary shuttle service to both courses. With over 100 years of history, The Donald Ross Course at French Lick offers the chance to experience golf the way it used to be played. Experience old-school links golf on a classic Donald Ross course situated in the rolling hills of the countryside. This package includes two days of golf on The Donald Ross Course at French Lick plus overnight accommodations at either resort hotel. Carts are included for all rounds, as is complimentary shuttle service to the course. Go ahead, take your best shot(s). Plan your 2018 golf getaway at French Lick Resort and book an ultimate group experience that adds even more bang beyond our championship Pete Dye and Donald Ross courses. 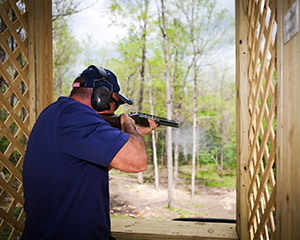 Eagles, Birdies and Pigeons is a new package for groups of 12 or more that features rounds of golf at both courses plus an adventure at our shooting range. 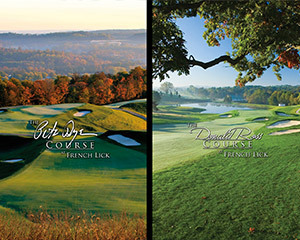 For more information or to book your golf package, call 888-936-9360 or visit frenchlick.com. Play Around the South Shore! The southern tip of Lake Michigan offers more than 25 semi-private and public golf courses for you to enjoy. Call now at 866-927-LAKE or visit alongthesouthshore.com and build an itinerary that includes championship golf, deluxe accommodations, fine dining, nationally known live entertainment theatre, casino action and much more. While you’re visiting the South Shore, check out some local breweries along the South Shore Brewery Trail. Find your favorite ale, stout or lager; dive into full-bodied beers, a hoppy IPA or a fruity and flavorful seasonal brew on your journey. Plan your tour with ease when you download the South Shore Brewery Trail App on Apple’s App Store or Google Play. Find a map of more than 20 breweries here.